Rt. Hon. 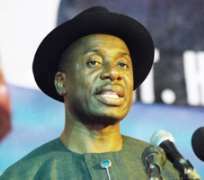 Chibuike Rotimi Amaechi, the Minister of Transportation and leader of Rivers State Chapter of All Progressives Congress (APC) has commended Dr. Henry Itotenaan Ogiri, former Executive Director, Admin and Finance of the Niger Delta Development Commission (NDDC) for decamping from the Peoples Democratic Party (PDP) to All progressives Congress (APC). Speaking at a grand reception in honour of Ogiri at County State School field in Abua/Odual Local Government Area, Amaechi who was represented by Senator Magnus Abe, APC candidate for Rivers South East Senatorial District in the legislative re-run elections, stated that Ogiri has demonstrated foresight in the interest of Rivers people and Abua/Odual in particular for joining APC. He urged other Rivers people who had been tied to PDP because of former President Jonathan for being in power should now feel free to embrace APC as Rivers people because of their history had never been in opposition. “Dr. Ogiri is an old friend and an old member of our political family. We know why some of the Rivers men and leaders stayed in the PDP. They felt that because of Dr. Jonathan was from the South-South and Niger Delta, they should not leave him at that time. That was the reason why some decent Rivers men and women on that principle decided to stay in the PDP. They did not stay in the PDP because of Nyesom Wike”. He told Rivers people that they should take advantage of this opportunity to get themselves at the centre as PDP had nothing to offer Rivers people and indeed Niger Delta. He stated that the APC led Federal government were working on the Calabar-Lagos rail line and airports all across the Niger Delta. This, he said, would provide employment, business opportunities and infrastructural development that would enhance the lives of the people of the region. He appealed to true Rivers men to leave the PDP sinking boat, pointing out that if Nigeria is in recession that Rivers State was already in a depression as many companies had left the state. He lamented that no investment had been coming into the state yet the governor was not bothered about this development because of politics. He said the governor for the interest of politics could jeopardize Rivers interest without caring a hoot. He reminded the governor that the essence of politics was to have a better life for the people and advised him to always protect Rivers interest without partisan consideration. Furthermore, Amaechi said with the defection of Ogiri that the politics of Abua/Odual LGA has changed for good in the interest of APC. Earlier, Dr. Ogiri had said that he decamped from PDP to enable Rivers people align with the Federal government in order to bring development and progress to Rivers State. He said that he decamped with more than 5000 members of PDP, assuring that his entrance into APC would change the political equation of Abua/Odual LGA and Rivers State in general. The former PDP chieftain and other decampees were formally received by the State Chairman of the party, Chief Davies Ibiamu Ikanya. Among top APC chieftains that were present at the occasion include; Dr. Dakuku Adol Peterside, Director General, NIMASA and APC governorship candidate in the 2015 elections, Elder Chidi Wiyorka, Engr. Sampson Ngeregbara Dr. Ipalibo Harry, Chief Emeka Beke, APC State Secretary, Hon. Augustine Paul Ngo, Hon. Raphael Muzan Ekpelu and Hon. Gift Igoma Loveday.